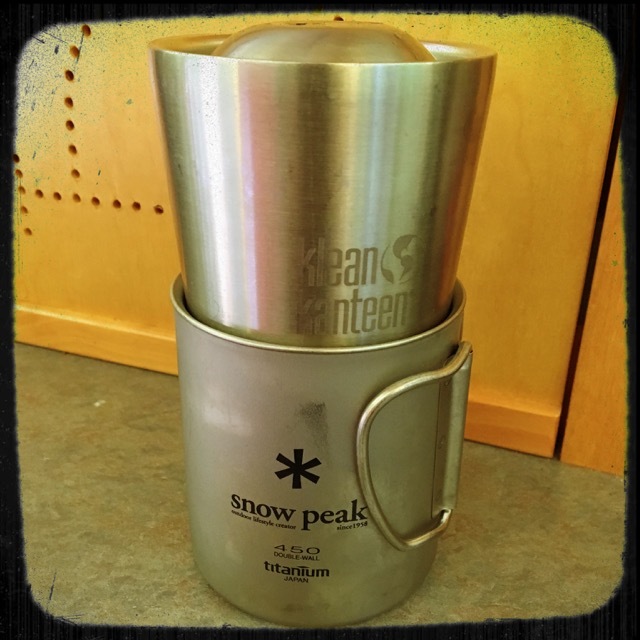 After years of using enamel mugs to drink my morning camp coffee and being annoyed at how quickly the coffee in them cooled and got cold, I noticed one day at REI that there are titanium camping mugs that are insulated. These things were super expensive ($50+ each)- were they worth it? I decided to research. Online reviews stressed that they were lightweight and easy to pack. I had to admit that since I’m not really carrying my coffee cup while backpacking or needing to get it into a tight packing situation with a bike pannier, the weight really isn’t the issue for me. I’m perfectly capable of lifting an enamel cup to drink. But I did like the idea of the fold up handles and the fact that it would likely allow me to stack the cups in with our other cups for storage in the galley, which is always a concern to make work efficiently. The biggest thing I got from the research was an understanding that yes, it would keep the coffee warm longer. And it didn’t hurt that you could get them in different colors (silver, purple, blue, green!) since we always seemed to be mixing up the coffee cups. I decided to try it out and ordered two. 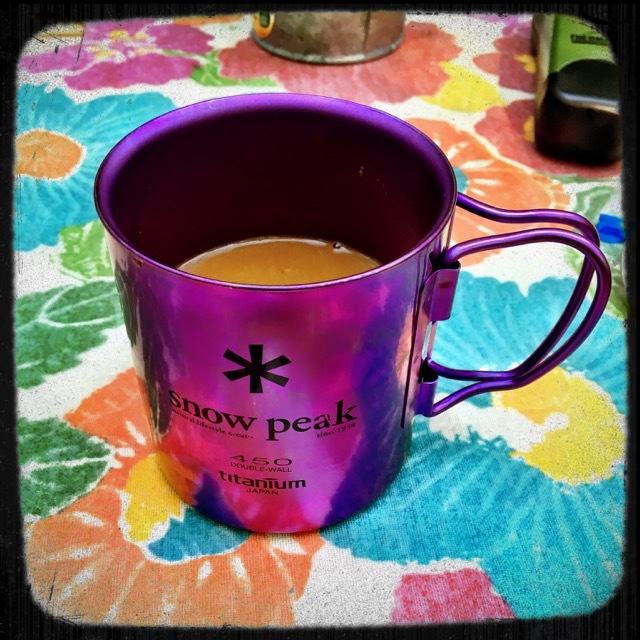 A year later, I’m still happily drinking coffee out of my Snow Peak titanium mug. It’s warm and delicious, even an hour after I first pour it. The mugs stack really well in the galley where we can put a klean kanteen tumbler and a wine glass together with a mug in a stack. We can always tell that mine is purple and Tom’s is silver. And maybe it wasn’t quite worth what I paid for it, but I don’t regret spending the money.